Today, when we want to capture an image given by the microscope we can either snap a photograph of it or obtain a computer-generated image. But prior to when photographic methods began making their way into biology labs and journals, this meant you had to draw it. For embryologists, this meant creating accurate, detailed drawings of either live or fixed embryos. Because developing embryos are three-dimensional, complex, and constantly changing, being able to render them by hand, let alone to see and make sense of them, was no simple feat. The task required meticulous observation of both the form and movement of cells, tissues, and structures. Pencil and paper weren’t used only as a recording device to create figures for publication, they also served as a form of note taking and played a central role in guiding embryologists’ observations of specimens placed under the microscope. A particularly rich example of the role of drawing and image making in late-19th century embryology is Edwin Grant Conklin’s cell lineage study of Crepidula fornicata embryos, a marine slipper snail that can be found all along the New England coast. Carried out at the Marine Biological Laboratory in Woods Hole, MA in the 1890s, this was a significant and influential body of work, especially with regards to cell divisions in the early embryo and the establishment of the germ layers. In The Embryology of Crepidula, the culmination of this study that was published in 1897, Conklin follows the division of nearly every cell from the uncleaved zygote all the way through to the larval stage. In doing so he demonstrated that the germ layers, particularly the mesoderm, and certain organs arose from specific, individual blastomeres in the early embryo. Such a meticulous study of the form and movement of individual cells required Conklin to take detailed notes, the majority of which were in the form of hundreds of drawings and sketches. 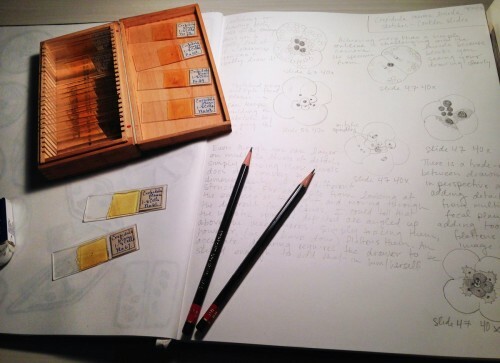 Especially in the later, more complex stages, these drawings were crucial to help him keep track of cells and to record exactly what he was seeing through the microscope. Because once he removed them from their egg sacs, Conklin couldn’t keep the Crepidula embryos alive long enough to see any substantial part of development, he worked mostly from fixed specimens stained with hematoxylin. Thus, his sketches were also key for piecing the developmental process back together from static “snapshots” of varying stages he encountered on every slide. Not only were the drawings themselves important but the process of producing them played a fundamental role in Conklin’s observation of each embryo. The inextricable relationship between drawing and observation was widely understood and appreciated in the late-19th century and even into the early-20th century. 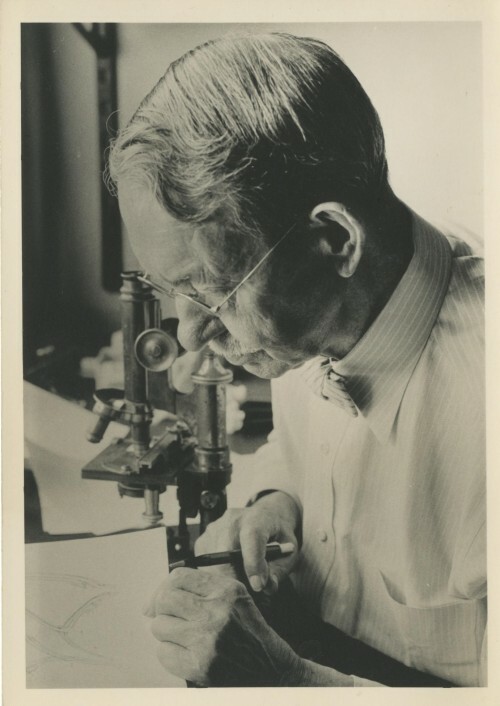 At this time, drawing was regarded as foundational to the education of biologists and to any research process, especially those involving a microscope. In Conklin’s Laboratory Directions in General Biology he writes, “drawings should be made of every object studied; this is necessary not only as a record of what has been seen, but also as an aid to accurate observation” (p. 6, 1st edition). Drawing requires the observer to make decisions about what to depict, necessitating immediate and thorough examination of the entire specimen, and choosing how to depict it. The process of drawing with the hand also heightens awareness of the spatial relationships of the components depicted. Like the majority of his contemporaries, Conklin almost always employed a camera lucida while sketching. Used widely throughout the 19th and 20th centuries by both scientists and artists, a camera lucida allows for a drawing surface to be seen simultaneously with the specimen of interest through the eyepiece of the microscope. Through a series of angled mirrors, the drawing surface and pen or pencil is superposed onto the specimen of interest. Because specimens can essentially be traced, Conklin believed that the use of the camera lucida allowed him to make his figures and observations as accurate as possible and to make sure that his claims were based on phenomena he actually saw. In his study of Crepidula embryos, Conklin created hundreds of camera lucida sketches, many of which have survived. The central role of these sketches in his process is made clear by the numerous markings on them. Many are marked with arrows, indicating divisions and movements, as well as identifying labels with question marks. Conklin then compiled those sketches into one hundred and five final, detailed figures drawn with pencil and watercolor. These were sent off to a lithographer in Germany who copied them onto lithography plates. The plates were printed and put through several rounds of proofing before finally being bound into the publication. Although much of the technology for creating them has changed, images still play a hugely important role in developmental biology. While photography has largely taken the place of drawing as the primary means of collecting data and producing figures for publication, many of the same concerns still remain with regards to how images are produced and what they depict. Like Conklin with his camera lucida sketches, biologists today often take hundreds of photographs of what they see through the microscope. Those images are then sorted through, compiled, and sometimes even slightly modified to produce publishable figures. While drawing by hand is no longer necessary to generate images of developing embryos, its role as an aid to observation, either from photographs or specimens themselves, still makes it a valuable and relevant skill. Especially for those wanting to learn or develop observation skills, drawing greatly enriches the experience of interacting with an embryo. It actively engages the hand in the act of seeing, heightens spatial awareness, and draws the eye to subtle details that may otherwise be overlooked. To learn more about my research on Conklin and visualization and image making in developmental biology and to keep up to date, visit me at my website or on twitter. To learn more about Conklin and his work, check out the Edwin Grant Conklin exhibit on the MBL History Project’s website. Conklin, Edwin Grant. “The embryology of Crepidula: A contribution to the cell lineage and early development of some marine gasteropods.” Journal of Morphology 1897, 13(1): 1-226.